This diagram shows the collaborative effort behind high fidelity wraparound (HFWA) services for kids with complex behavioral health issues. 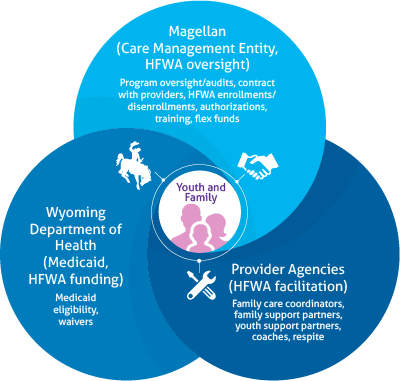 The Wyoming Department of Health (WDH) and Wyoming Medicaid is working to help kids with complex behavioral health challenges find local care, instead of being placed in residential psychiatric treatment. The state contracts with Magellan Healthcare to coordinate what are called high fidelity wraparound services that allow kids to receive treatment while staying in their own homes. "The program is specifically targeting children that have any kind of psychiatric or mental health diagnosis, or kids that have any social or emotional challenges that would make them at risk for an out-of-home placement," said Lindsey Schilling, a Wyoming Medicaid Provider Operations Administrator. She said the four-year-old program is showing positive results. "Clinically I think the evidence would support that children with these types of services needs do better if they receive these services in home environments, in their own communities, their own schools," said Schilling. A statement from the WDH released this week reported that the number of out-of-placements for program participants have decreased and that while some kids still need out-of-home treatment, the length of those stays has also decreased. The program is also more cost-effective, according to the WDH statement. The program primarily serves kids ages 4 to 21 who are enrolled in Medicaid, but kids who don't qualify can apply for a waiver. In both cases, kids need to score high enough on a mental health needs assessment. Some say the required clinical assessment score is too high, excluding kids who are not yet in crisis but who would benefit from extra support. Schilling said the program is up for renewal, and a part of that process involves reaching out to stakeholders to discuss improvements. Federal Regulations Shutdown An Inpatient Pysch Bed Unit, Now What? At the end of February, a major inpatient psychological unit in Wyoming closed its doors. The PineRidge Inpatient Behavioral Health Unit in Lander had shut down partly due to federal regulations. This has created a domino effect and the outpatient behavioral unit will also close its doors April 5. This leaves a mentally ill population without accessible critical care in northwest Wyoming. The first four-person team of American veterans rowed across the Atlantic Ocean in an effort to grow momentum on the need to increase awareness of and support for the mental and physical health of veterans. Two of those veterans are from Northwest Wyoming.